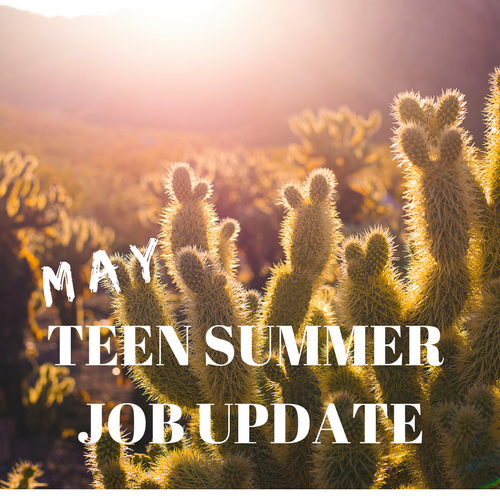 Teen Summer Job Update: May Gains Down 6.4 Percent | Challenger, Gray & Christmas, Inc. The number of teenagers finding jobs in May declined for the third consecutive year, as a growing number of this population either struggles to find summer employment or simply abandons the traditional labor force. 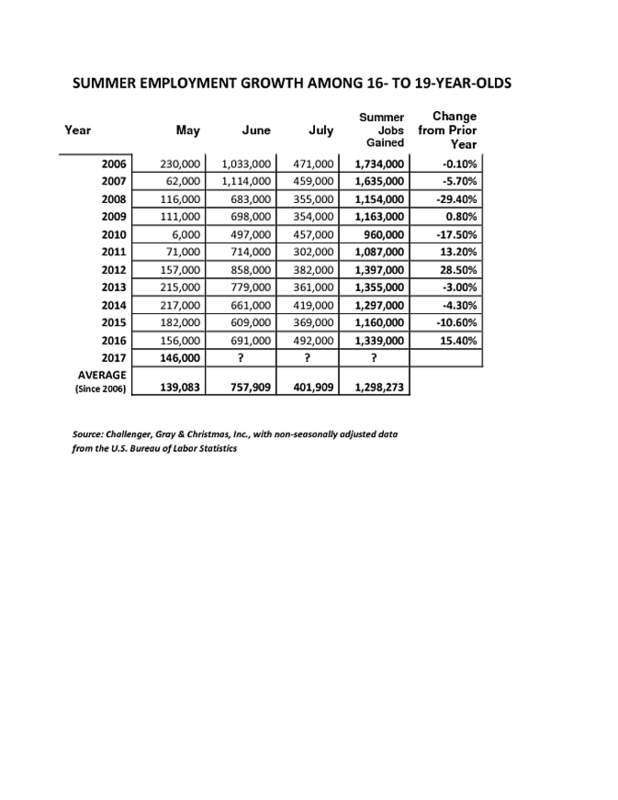 Employment among 16- to 19-year-olds increased by 146,000 in May, according to an analysis of the latest Bureau of Labor Statistics data by global outplacement and executive coaching- firm Challenger, Gray & Christmas, Inc. The job gains in May were 6.4 percent lower than last year, when teen employment grew by 156,000. May marks the beginning of the summer hiring surge, which since 2010 has seen an average of 1,227,857 teens added to the workforce between May 1 and July 31. May typically experiences the smallest hiring gains of the three-month period, with the average May gains hitting under 140,000 since 2006. “Last summer saw the highest teen job gains since 2013. May typically sees fewer teens added to job rolls than June and July, but this could be due to the fact that students are still in school until the end of May or early June,” said John A. Challenger, chief executive officer of Challenger, Gray & Christmas. “Moreover, teen summer employment has fallen on average since the 1970s. This is due to several factors, including the movement of blue-collar workers, whose jobs were lost to overseas competition or technological advancement, to service sector jobs once dominated by teens. “Teens also have other summer priorities, such as school, volunteer opportunities, or family obligations. They might find a few hours of work here and there through family and friends, or work in the ever-expanding gig economy, which is difficult to measure” said Challenger. While May gains are off to a slow start, June is typically when the majority of teens find summer employment. With the decline of traditional retail opportunities, teens can find work in leisure and hospitality, like theme parks, movie theaters, and park districts. Their tech skills may also be valuable in traditional office settings to potentially digitize files or help set up social media profiles. “Regardless of where teens are looking for work, employers are increasingly looking for soft skills, characteristics such as the ability to work in a team, writing skills, and confidence in speaking in meetings or with management. Teens who are in the job search should brush up on these communication skills in order to help facilitate landing a position,” said Challenger.